Over the past couple of months I have been working on a web app for the Mojo-Themes website, this web app is entirely built on the new jQuery Mobile and should work across all mobile devices which they support. Please note all testing and screenshots below have been tested on an iPhone/iTouch. The Mojo-Web app pulls all the latest items from the RSS Feeds and gives you an easy way to view them on your mobile theme and also much more! Currently the look of the web app uses the default jQuery Mobile themes and I wont start working on the design until its feature complete and mostly bug free, the look will change and will look like the new Mojo-Themes redesign soon. If you have any more ideas please post in the comments! All the latest 15 items are shown in each category and also the mojo blog posts, you can use the search at the top of the web app to instantly search through these. I have also included a cache time (15mins) to reduce some server load and also linked to the jQuery code instead of hosting jQuery files locally. As its a beta everything will be a little rough around the edges and I plan improving the functionality over this and next week too everything up. This includes cleaning all the code up, adding features, improving the images (app icons etc) and more. If it says “Error loading page” please post in the comments, unless its the latest tweets as I’ve done this on purpose. 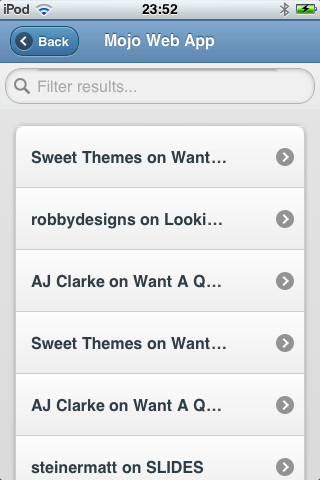 I also have big plans for version 2 however most of the functionality is in testing via the jQuery Mobile Team. I am open to feature requests so post below if you think your suggestion will be beneficial!